Metro after Hannes Van der Bruggen? The name of Belgian midfielder Hannes Van der Bruggen surfaced in connection to an MLS team, which has been revealed as RBNY. The defensive midfielder, 25, is currently the captain of KV Kortjirk, where he is under contract until 2021. 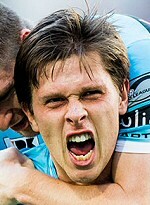 He started his career with Gent, helping them to the league title in 2015. "I do not even want to know which club it is. I want to stay with my current club," Van der Bruggen told Belgian outlet HLN. We haven't heard about Kortjirk before today either, Hannes.